It’s been two years since my last costume creation, and the stitching itch finally got the best of me. 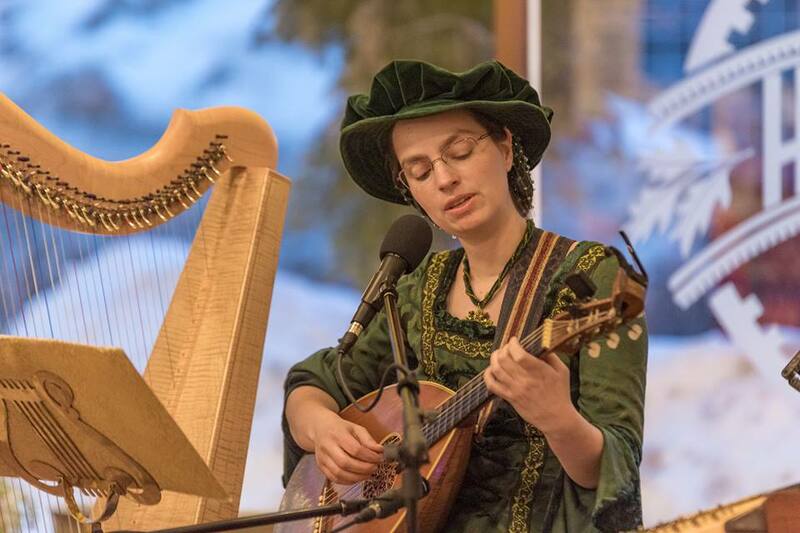 That and the season of St. Patrick’s Day with its Celtic performances reminded me of my dwindling inventory of handmade gowns to wear–a signature part of my music performance presence. Most of my previous collection of Celtic/Renaissance gowns I had made during my college work, and many of them no longer fit my rib cage (an inherited family trait, which might help with singing but not with fitted garments), so I had sold most all of that inventory through my Etsy shop. Remembering Julia Cameron’s remark in The Artist’s Way that a closet full of clothes does not invite new ones, it was time to let the beautiful but unwearable dresses go. Some of the gowns have gone to children’s Shakespearean theaters, some to private collections, some to Halloween parties. It was rewarding to hear the stories and see these wearable pieces of art find new lives and appreciators. When I think about building a gown to support my performance work, I’m interested in the overlap. Many of the ballads and tunes I play are quite ancient and require a breathing of new life into them. Transforming cast-off fabrics like a table cloth from the thrift store and hand-me-down set pieces mimics the same process and shows how even that which has been discarded and forgotten can become quite beautiful beneath the artist’s hand. This process can create serious challenges, such as having to craftily plan out the cutting process in order to avoid using heavily faded parts of the fabric. But just when the artist is faced with new challenges, ingenuity ensues. It’s like building a puzzle where the finished product is in the mind’s eye–transforming flat fabric into a three-dimensional object meant to be worn by a three-dimensional object (the human form) that will move in it. 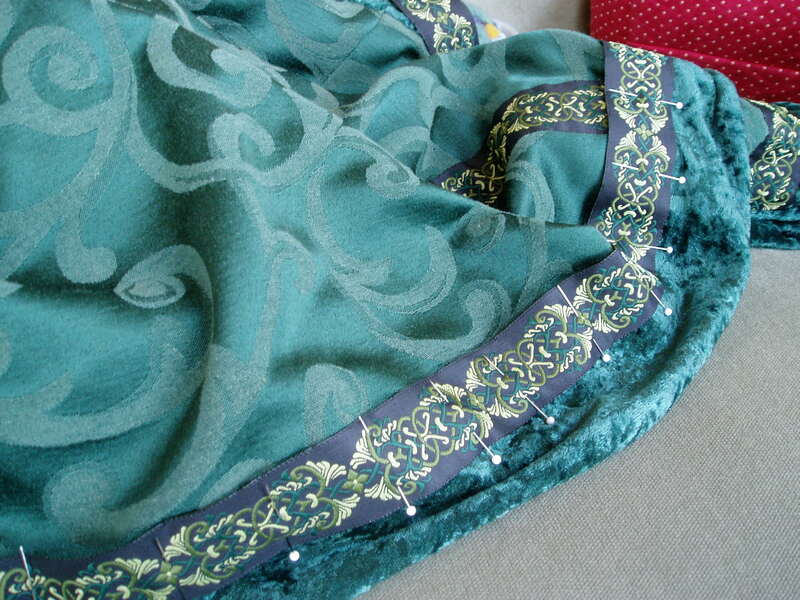 It turned out that almost everything I would need for the gown was in my stash–fabric, thread, zipper, lacing. But I wanted to give this one something special, something that would make it pop. 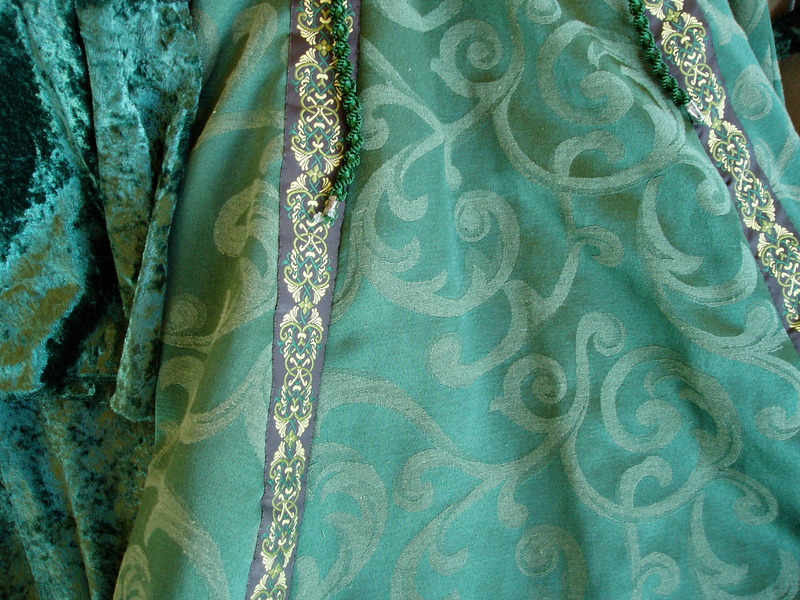 Searching online, I found a “Middle-Earth inspired” Jacquard trim in beautiful swirling greens and ordered it immediately. The shipping time was oddly vague and indicated that it might not even arrive until after St. Patty’s Day, but I decided to trusty my gut and the process. Two weeks later (well ahead of the celebration day), the ribbon arrived stamped by customs in Turkey. Goodness! Is that where the ribbon was made? Now even this element possessed an interesting story. I cut off the stamp as a keepsake, taped in my journal. Unlike any of my other previous costume projects, I decided to stitch this piece entirely by hand. Winter evenings for our family are a treasured time for sitting by the wood stove, reading a book out loud or enjoying a documentary. 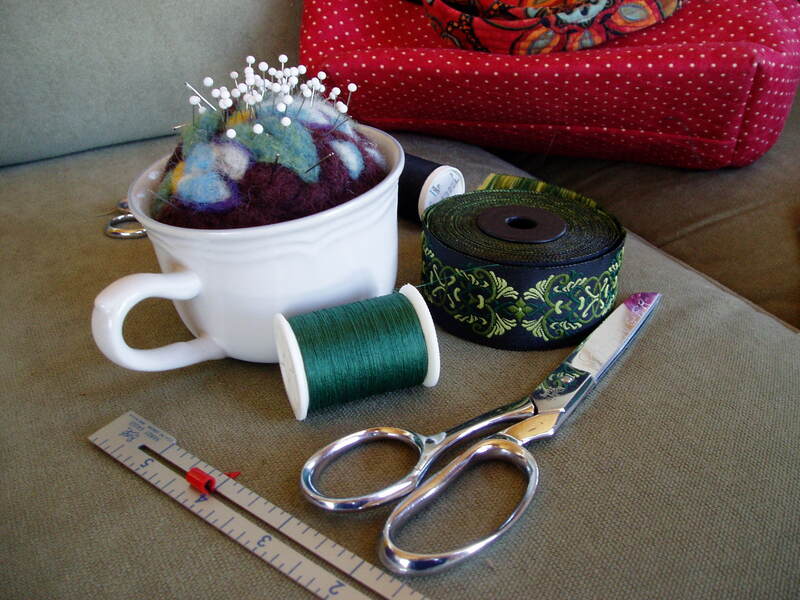 Instead of holing up in my studio with the sewing machine, I could spread out on the couch, stitching away while still enjoying conversation and camaraderie. This method certainly made the process take longer, but the slowing effect actually brought a therapeutic element to the project. 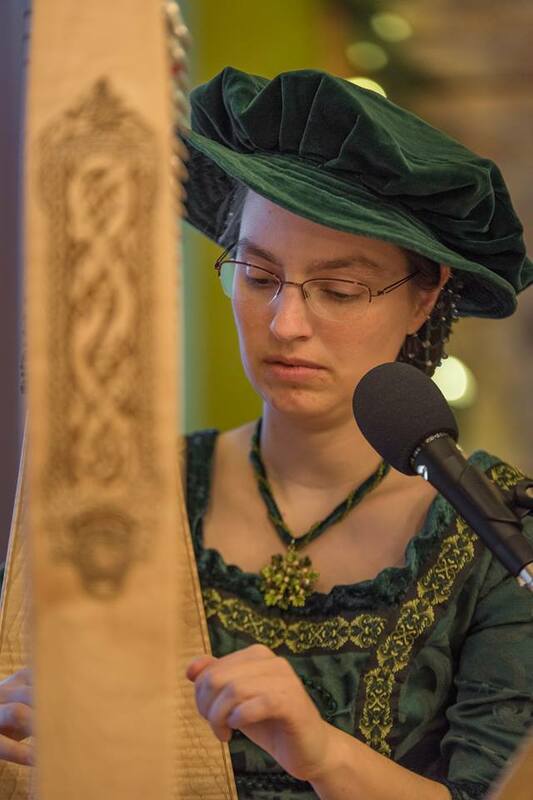 Not only was I stitching an elegant dress in a lustrous color, but I was also stitching together a new chapter both in my performing practice and costuming process. There was healing happening, and there was also no grumbling at the old, sometimes cantankerous sewing machine! 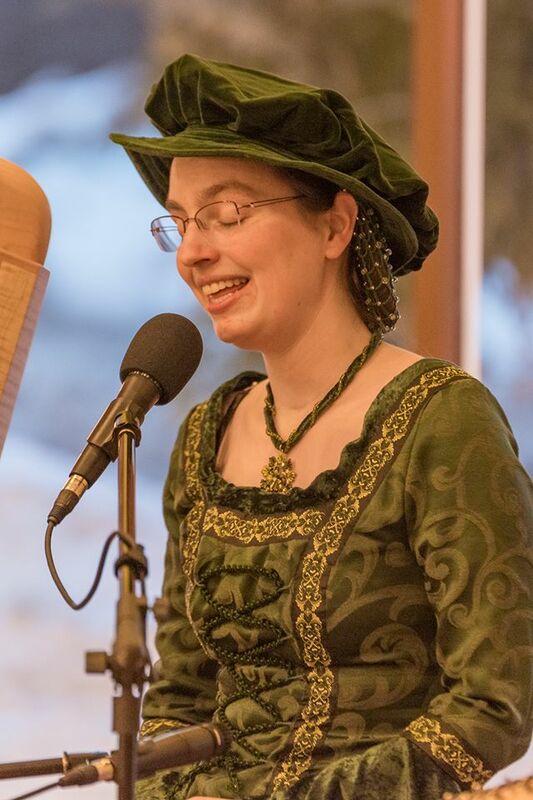 Just two days from my first concert this month, the gown was finished–complete with all the trim, velvet accents, laced front, and a matching necklace I made from a pendant that was also in the stash. 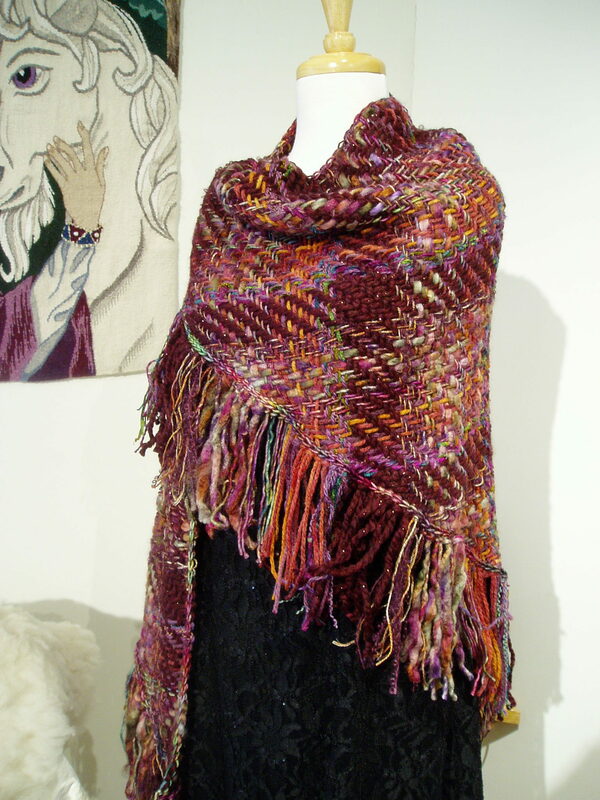 This was a perfect pairing with one of my beaded snoods and a velvet slouch hat made by Christine Lendved. Here are some images of me wearing it at last night’s Duluth Folk School performance. (Photo credits for the following images, Bryan French). Welcome to the collection, lovely green gown. There will be certainly be more to come! The first quarter is finished! 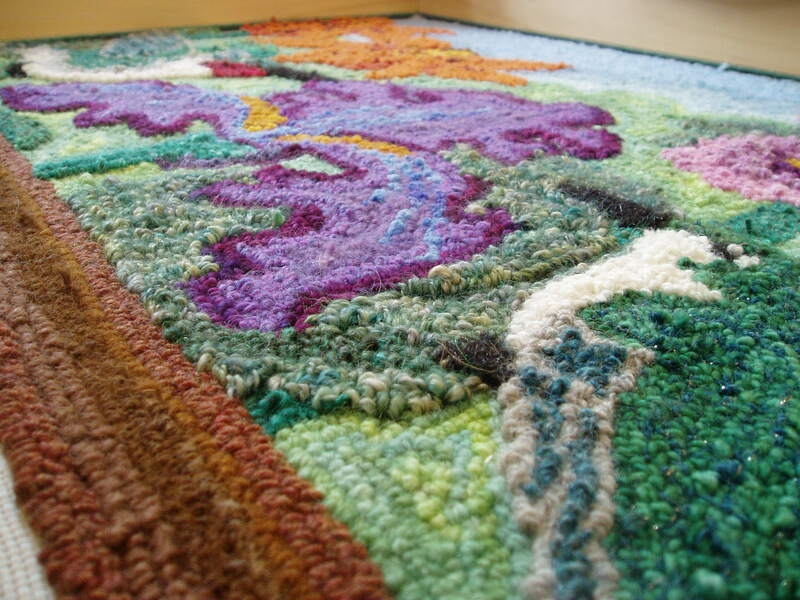 And not just the first–the largest and hardest quarter, filled with all the color and texture decisions that will then replicate into the other quarters of the commissioned tapestry. Hooray! And I’m very happy with the results. Here it is shown on the working side (which will actually be the back side of the piece when it’s finished). For a large piece with this many different overlaid images, it’s important to give enough differentiation between the elements without creating too much visual competition. Hence the background colors are subtle and muted, while the foreground colors are more vibrant. In a visual composition, the eye will be drawn to the highest contrast in the piece first, such as white against black. Keeping this in mind, even though the hummingbirds are green and the background is also green, they are the only element in the design that utilizes white and black–hence they hold the most contrast. Let’s flip the piece over now and look at the front side. 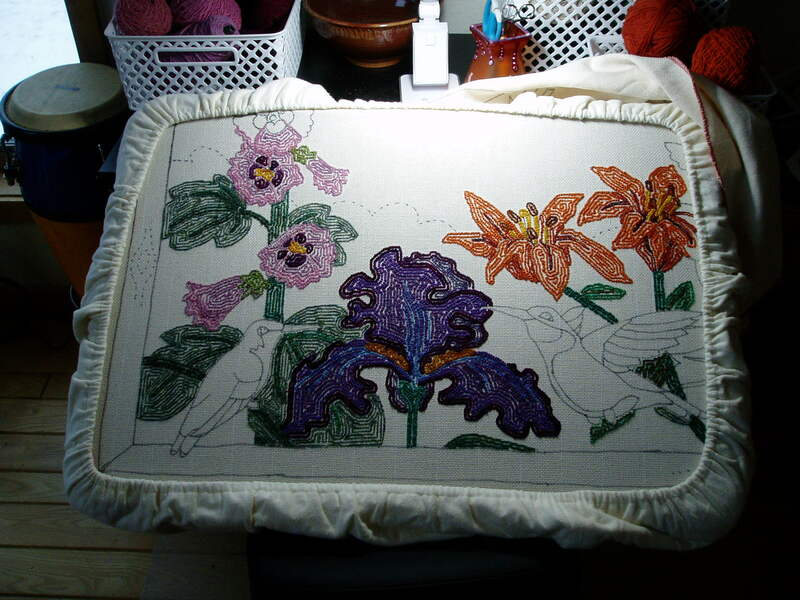 Now we can see how all those delicate yarn choices have worked out on the front side of the piece, including the wood grain mimicry, veining in the leaves and flower petals, individual wing feathers, shading, and so on. 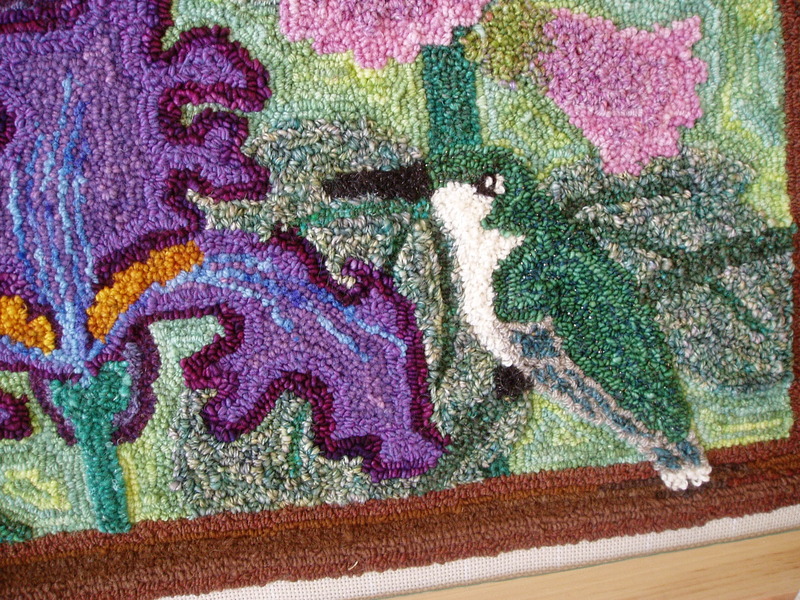 When the full piece is hanging on the wall, this will be the lower right portion of the punch needle tapestry. 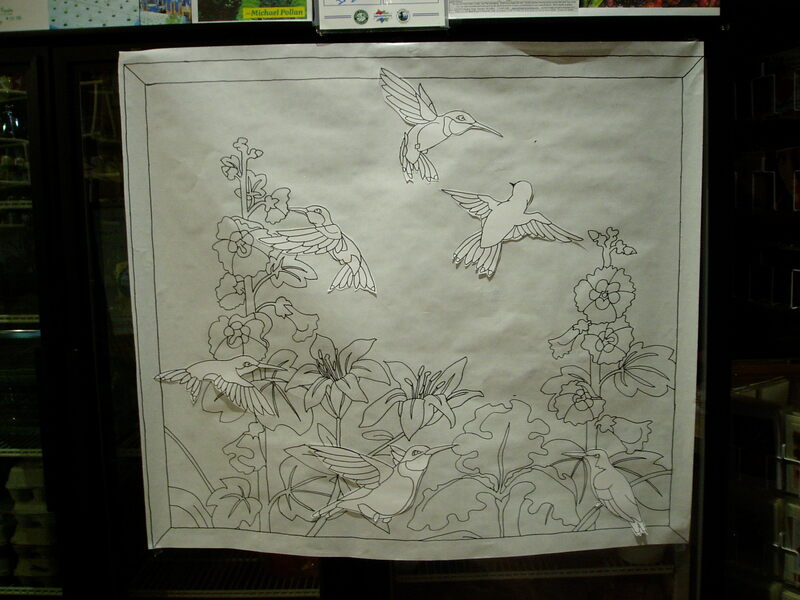 Of course, I want the hummingbirds to really shine in this piece–literally. An interesting fact about birds (and butterflies) is that while colors such as red, black, brown, and yellow come from pigments in the feathers, the colors blue, green, and purple can only be achieved via prisms within the feather structure. In the shade, these feathers appear black, but out in the sun, they glisten beautifully. 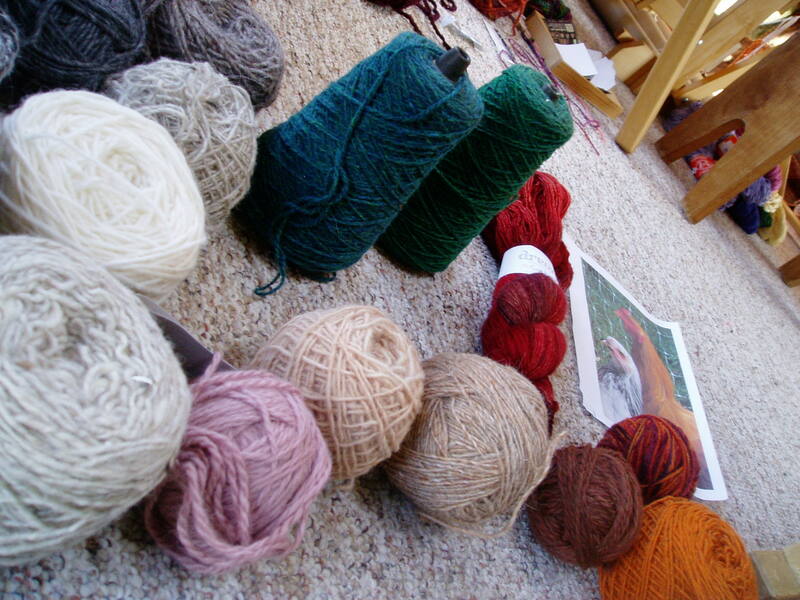 Dyed wool, however, is made with pigments, not prisms. So I had to find a different way to bring in that sense of glisten. Combining a kettle-dyed green wool with a crimpy wool-blend yarn with novelty metallic thread, the hint of shimmer comes through on his back, head, and wing. These were not the easiest fibers to convince through the punch needle, but they were worth the extra effort. A super-saturated variegated red brings to life the sense of individual glinting feathers on the ruby throat, each refracting the light depending on its angle to the viewer. The female hummingbird is a little more subtle, though she has her own style of shimmer via a metallic thread carried on a dusty green wood-blend. Even though she is at rest among the greenery, she still has her to stand out from the background. When a hummingbird male is busy making his U-shaped courtship flight, I always look for the female in the bush. Even if you can’t find her right away, she’s in there. And he knows it! Another element that helps the objects of focus stand out (literally) in the arrangement is the use of different length punch needles. 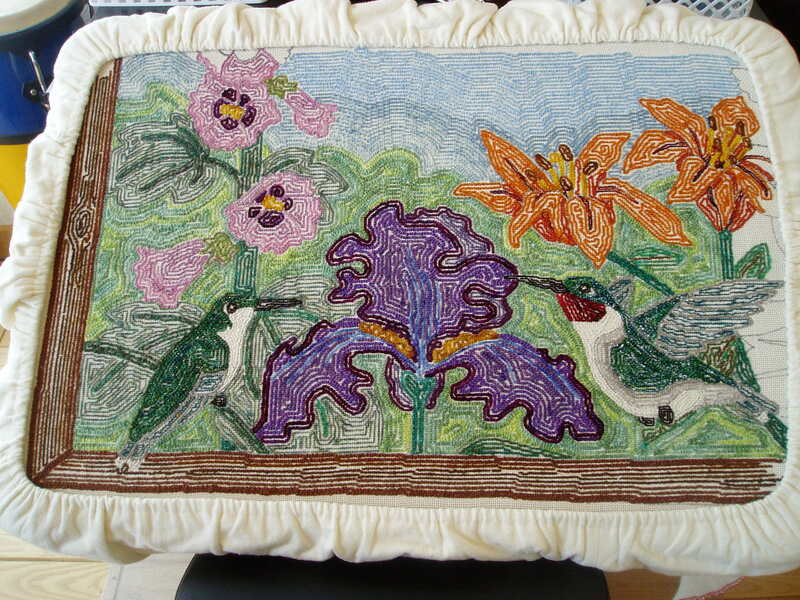 The sky, background greenery, and wood border are all made with a shorter punch needle, while the flowers, foreground leaves, and hummingbirds are made with a longer punch needle. The lengthened shaft leaves behind longer loops, thus allowing for some actual three-dimensionality within the piece. Here is an angle shot to help you see how this technique plays out. 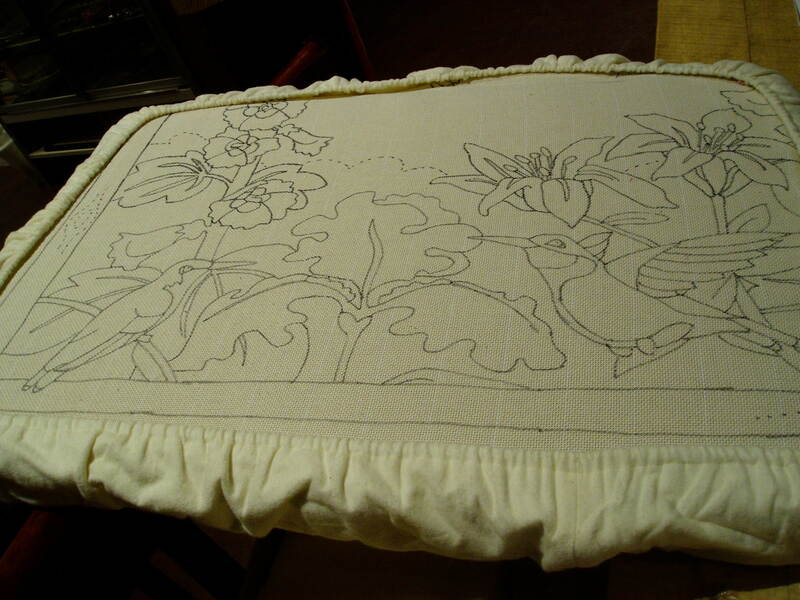 And now it’s time to move the backing on the frame and begin a new quarter of the tapestry! Stay tuned for further updates. I remember the interview for Vermont College, when I was asked what I hoped to be doing in 10 years. I remember enthusiastically relaying that I wanted to have my own folk school, teaching traditional skills and keeping them from becoming lost arts. That was in 2004. 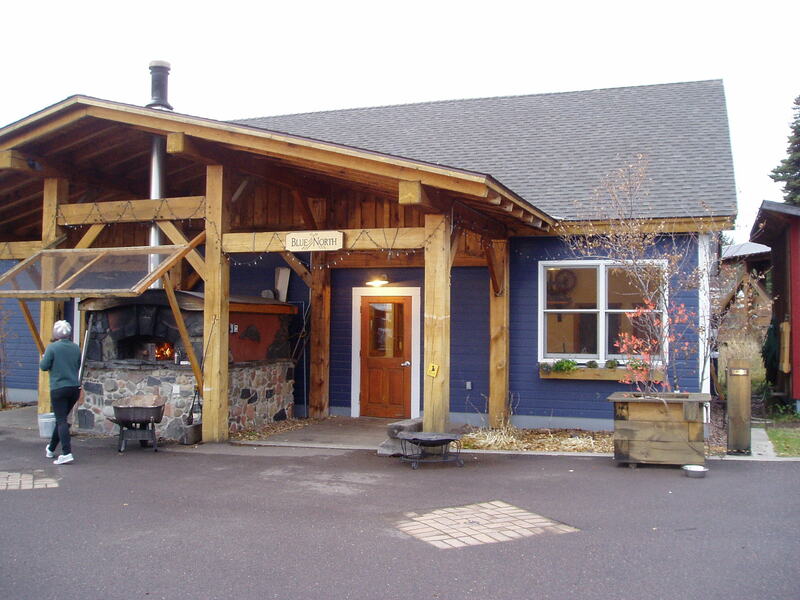 Ten years later, classes and workshops were part of our initiatives at Farmstead Creamery & Cafe, with limited success. There was wreathmaking and pumpkin carving and a few fiber arts classes. But the events just weren’t kicking off as I had hoped. In 2017, I started offering afternoon fiber workshops through the local technical college. Some classes were well attended, while others struggled to have enough enrollment to run. But the audience was widening and so were the diversity of classes I was offering. Then something changed this winter. As with other years, I put together a slate of classes, posted them on the farm’s event calendar online, and made events for them on the studio Facebook page. At first, attendance was small (as usual) but enjoyable. It was December, and the weekend classes were themed as needle felted ornaments. 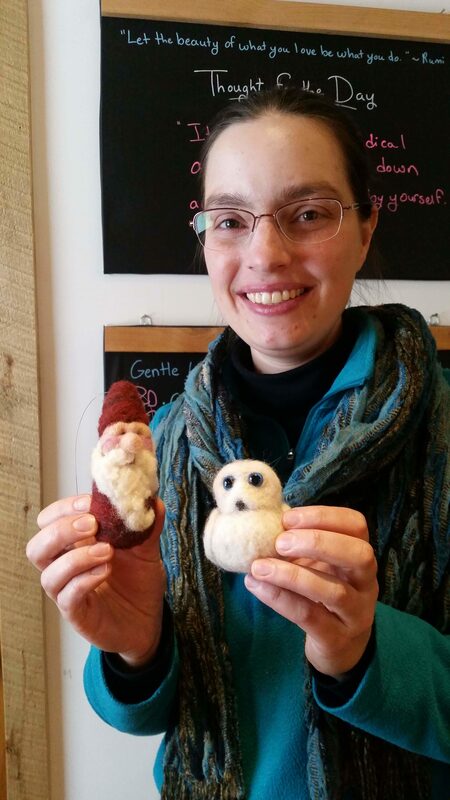 We made cardinals, Santas, and angels, but the last class before Christmas was a needle felted snowy owl ornament. The project looked cute and fun, and I’d hoped folks would sign up for it. Little did I know how much the cute and fun factor would have an affect! I’d heard about pictures or videos going viral online, but I’d never heard of classes going viral. I was certainly not expecting one of them to be mine. First the Saturday afternoon class filled, so I added a Saturday morning class. Then that filled and I added a Sunday class. As the weekend approached, I madly tried to contact the several dozen people who had marked themselves as “going” online to finalize the reservation so that folks wouldn’t simply show up to find a full house! Over 70 more had marked themselves as “interested.” This list was almost entirely filled with people I didn’t know. 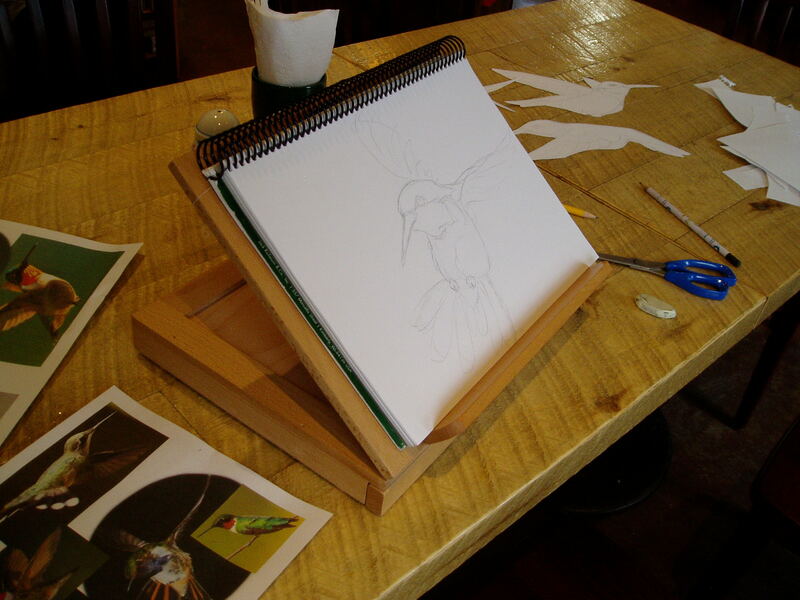 The trend continues into the New Year, with two fully-booked cardinal classes last weekend and a rematch on the snowy owl next week. 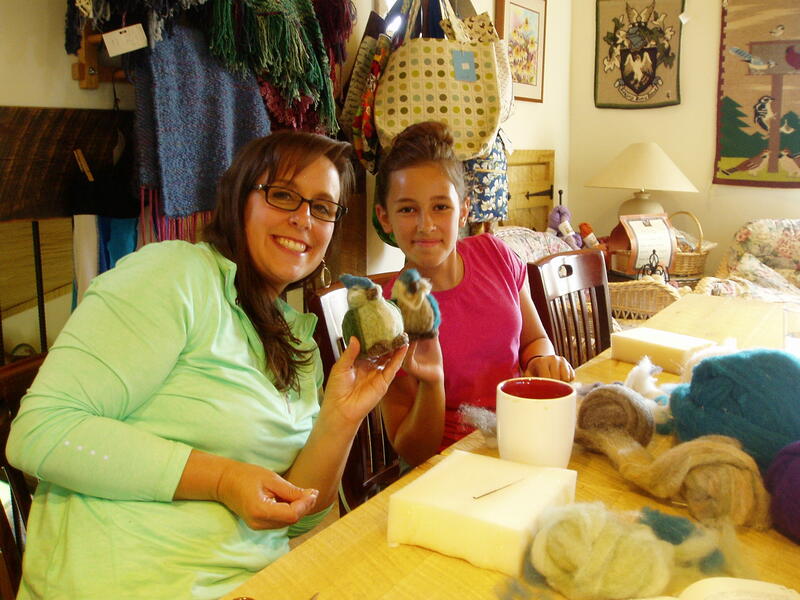 Almost every student is new to needle felting, but they couldn’t resist because of the cuteness of the project. So even in the depths of winter, when the snow and wind and darkness keeps folks at home–cuteness is a motivator that breaks through. 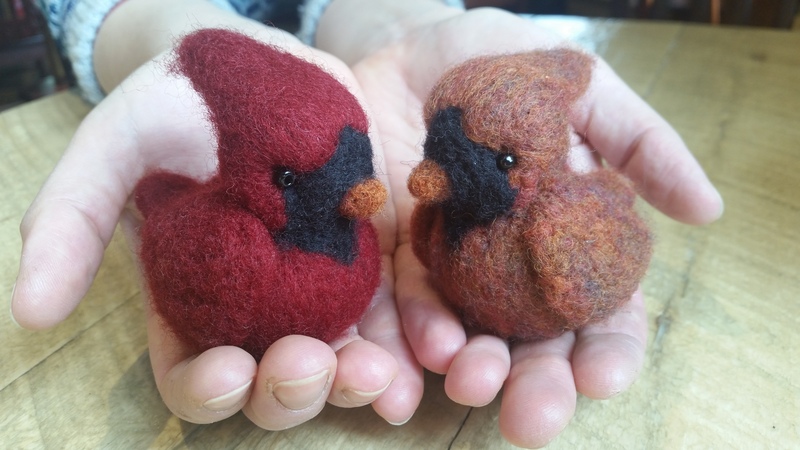 Prepping for more classes also builds ideas for new needle felting kits–an option that works great for potential students who can’t make the class. It’s also a great way to use the beautiful, hand-dyed wool from our farm. 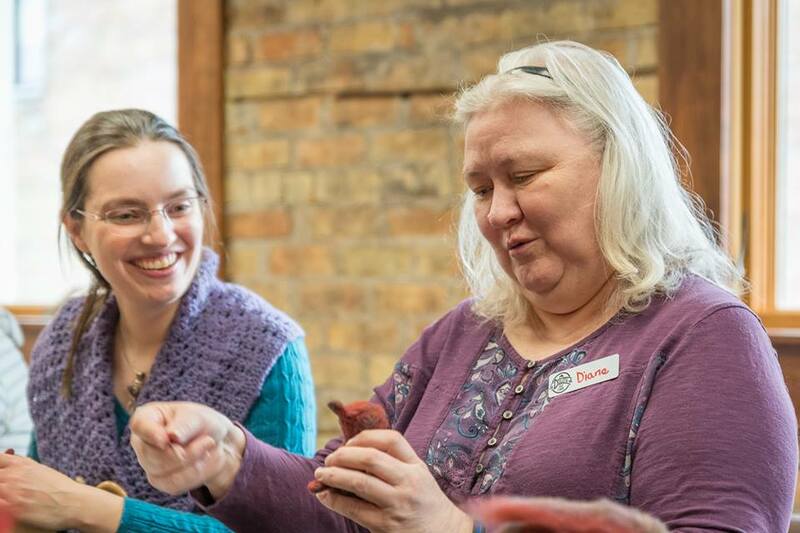 While a back-to-back day of needle felting classes can be exhausting, it’s also a joy to be sharing the skills with others so they can add needle felting to their palate of creative expression. There is no end to the magic of creating something with your own hands, especially when it starts from amorphous ingredients like fluffy wool or a pile of yarn. 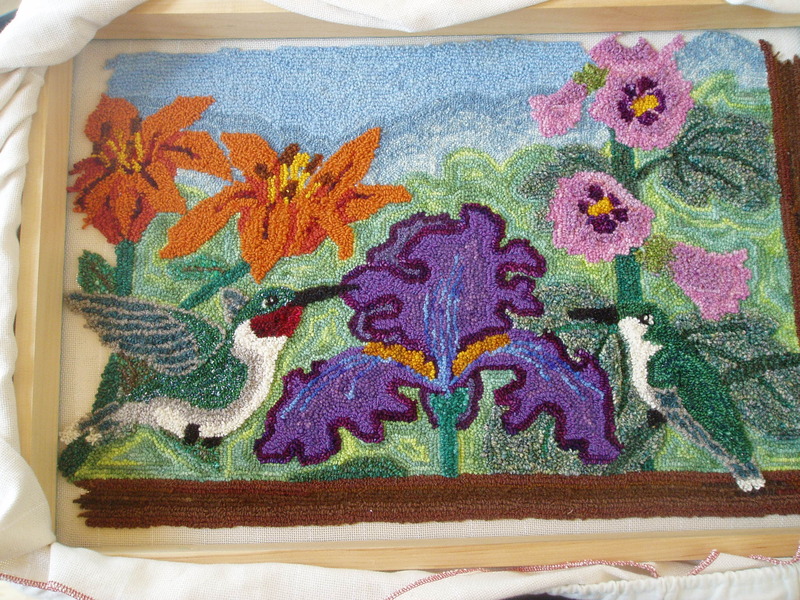 My hope is that the trend will continue and that, eventually, students will be interested in additional, more complicated classes–weaving, punch needle rug hooking, tapestry. The space is built, maturing, and gaining reputation. Now it’s building the audience and interest. Who knows, maybe that folks school really will happen someday. Designing a project is a critical phase, but the leap from design to execution can be daunting. When faced with the blankness of the raw warp or, in this case, the bare monk’s cloth with traced outlines, I know that jumping in will take some artistic encouragement. This includes building the right environment–one that is conducive to doing the work, which often must be balanced amongst the many other rigors of the day. My large-scale fiber artworks thrive best in environments where they can settle in, instead of needing to constantly move about because they are in the way of other daily activities. It’s also important to be comfortable while working and have adequate light. There is never any joy in finding out what you thought was yellow last night is actually too orange by morning! Creating the right studio support for “Hummingbird Haven” included refitting an office desk with organizational baskets for sorting yarn, an oversized ceramic yarn bowl, an ergo kneeling chair (love this one), an Ottlite (as introduced to me at the folk school), and a vase for holding punches and scissors. The Ottlite casts a light that mimics daylight, instead of the yellowish glow of nearby lamps. The head and boom are also adjustable, helping to bring light to where the work is actually happening. 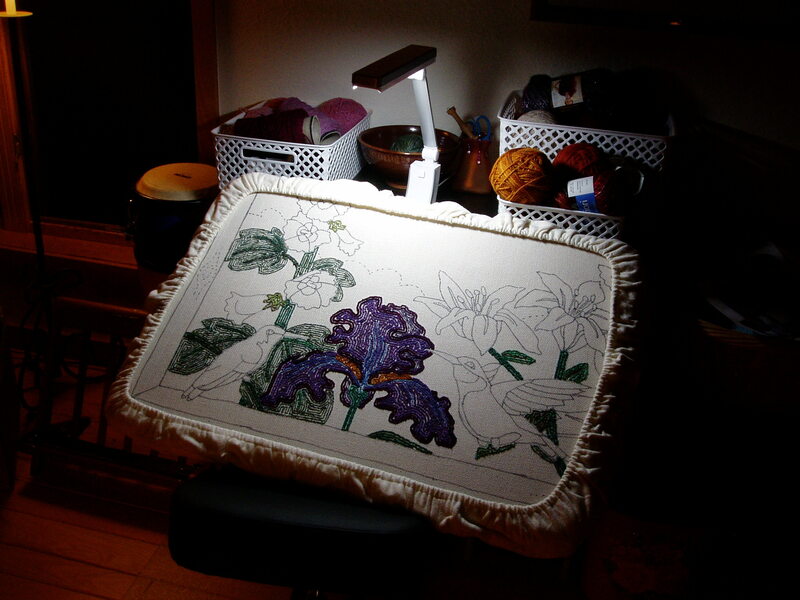 Though minimal (especially compared with the space occupied for large tapestry production), this setup is serving as an excellent work station for punch needle tapestry. Vibrant colors begin their entrances, adding splashes of life to the black-and-white line drawing of the design. 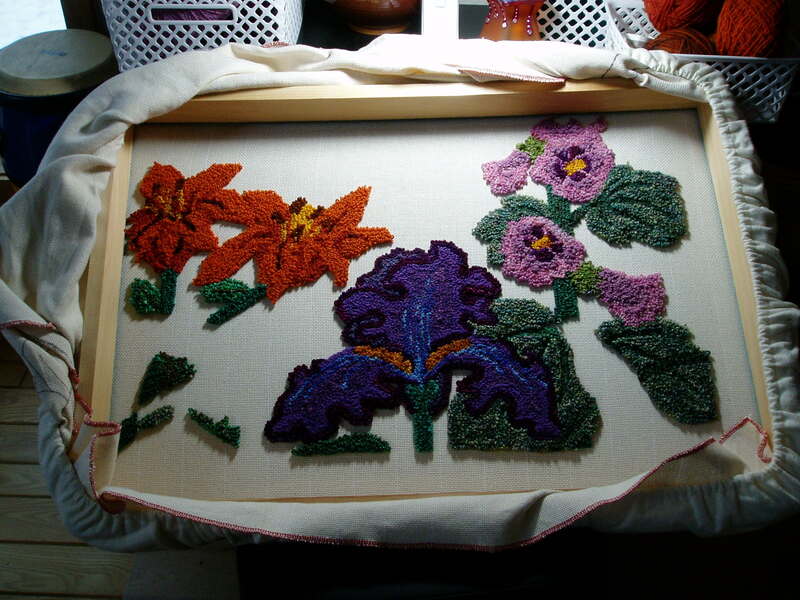 Beginning with the iris, I then moved towards the leaves and stems, the hollyhock blooms, and the tiger lilies. Instead of embarking on the birds right away, I wanted to set the scene and introduce critical colors. 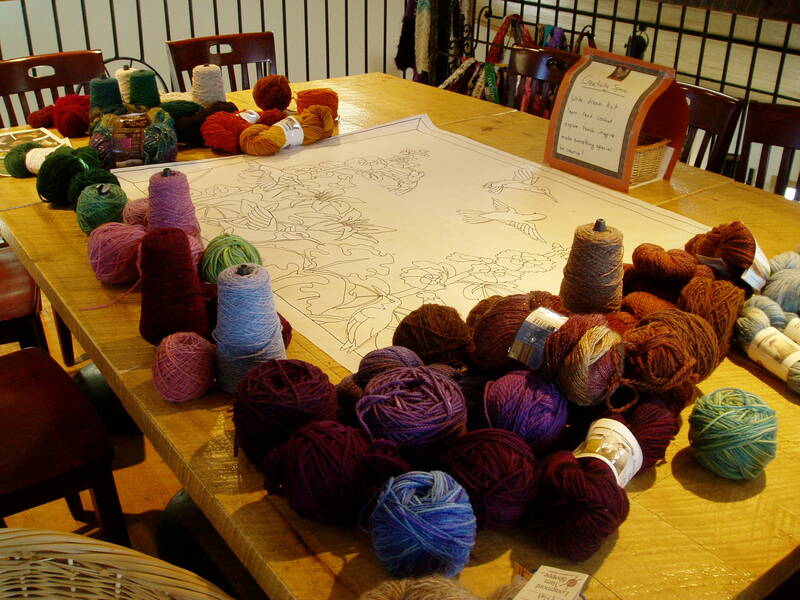 As each new element is brought to life in yarn, this involves important choices in coloration and shading. 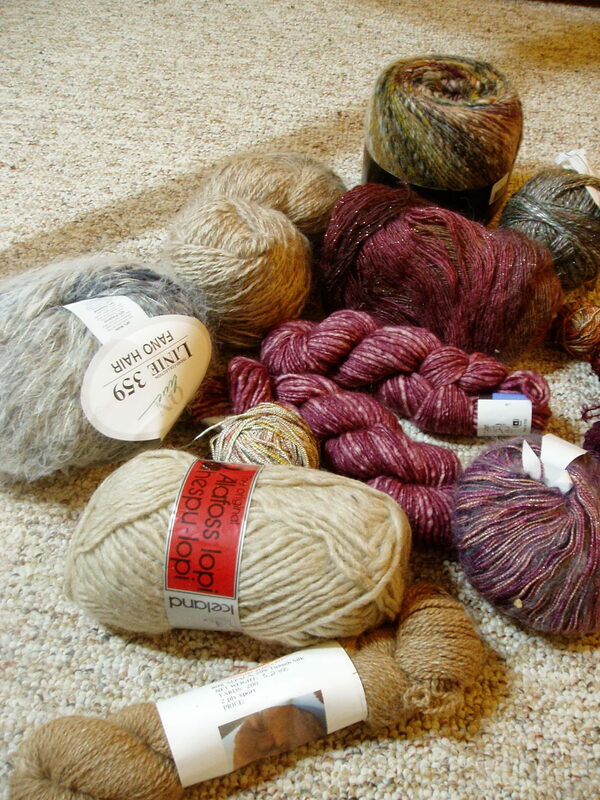 I may have eight colors of yarn I’ve set aside for a particular object (say, the tiger lily) but ultimately use five of them. 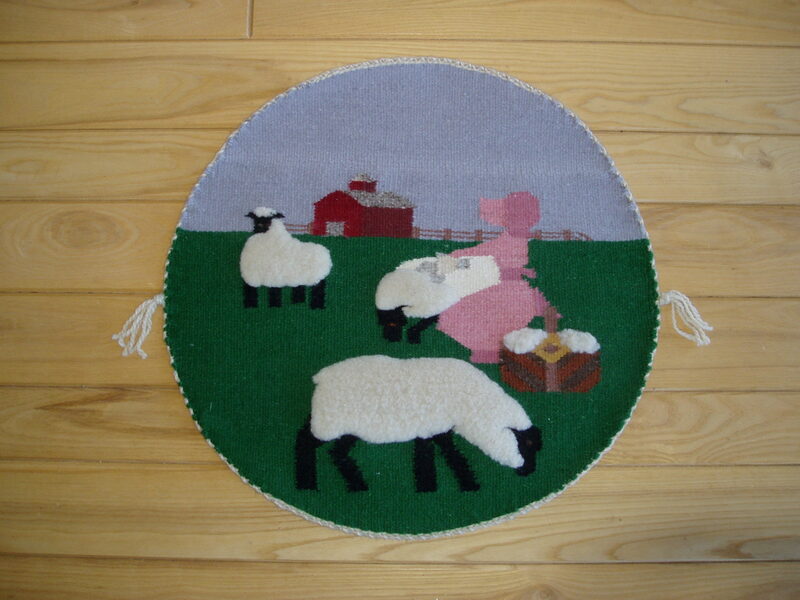 The range of colors that make it past the finalist round of selection and are integrated into the punch needle tapestry ultimately adjust the tone and color mood of the piece as a whole. Because the hummingbirds are the stars of the show in this tapestry, I want to be certain that the colors I choose for them are especially stellar against the context of their floral environment. Next in line is the wood-toned border. 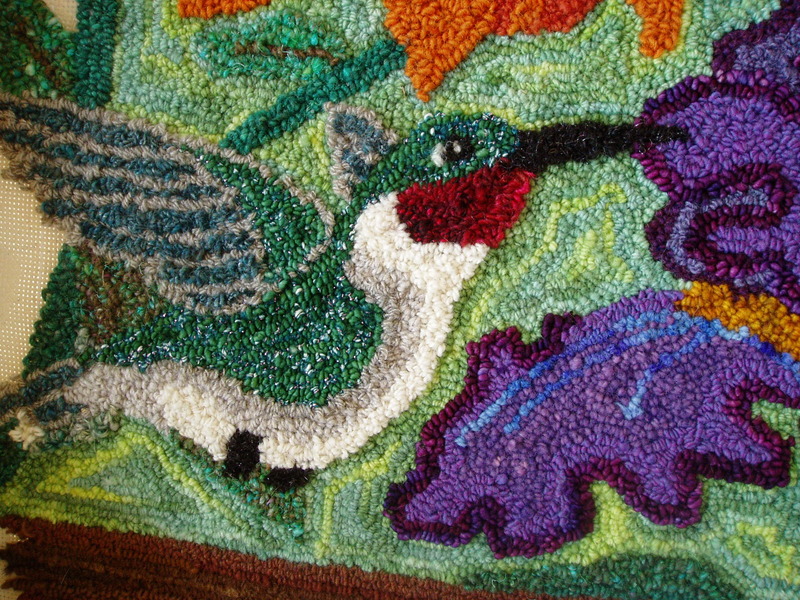 Punch needle rug hooking is worked on the back side of the piece, leaving the loops that make the front-face of the artwork on the opposite side. Periodically, I will turn the work over to see how it is coming together on the “front,” adjusting as necessary and trimming ends. How different the front side appears! That is part of the magic of this medium, laying down the image and texture one loop at a time. 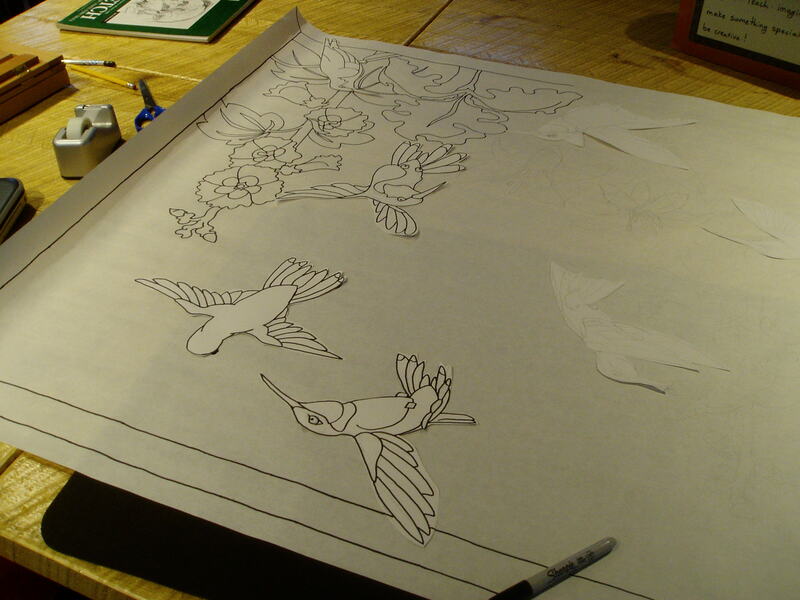 Stay tuned for continued progress as the “Hummingbird Haven” commission comes to life. As an interdisciplinary artist, it’s important to keep adding to the toolbox–discovering new techniques, fresh alternatives, and new mediums to explore. Otherwise, even the most engrossing work can grind down to tedium and boredom. And I don’t do boredom. So each winter season on the farm, we make a concerted effort to tag each other out in order to create the space for “filling the well”–venturing out to learn, explore, recharge, and grow. This year, I was after one of my bucket list items: attending a course at the North House Folk School in Grand Marais, MN. The school had started up just a couple years before we moved north to the farm, but it had just never worked out for me to go previously. Now it was time, and I scoured the newspaper-like catalog filled with offerings with a mix of intense purpose and glee. Months later after registration, with rolling suitcases and therapy harp packed in the PT Cruiser, I was heading north along the shores of Lake Superior, off on a weekend adventure in beginning millinery. 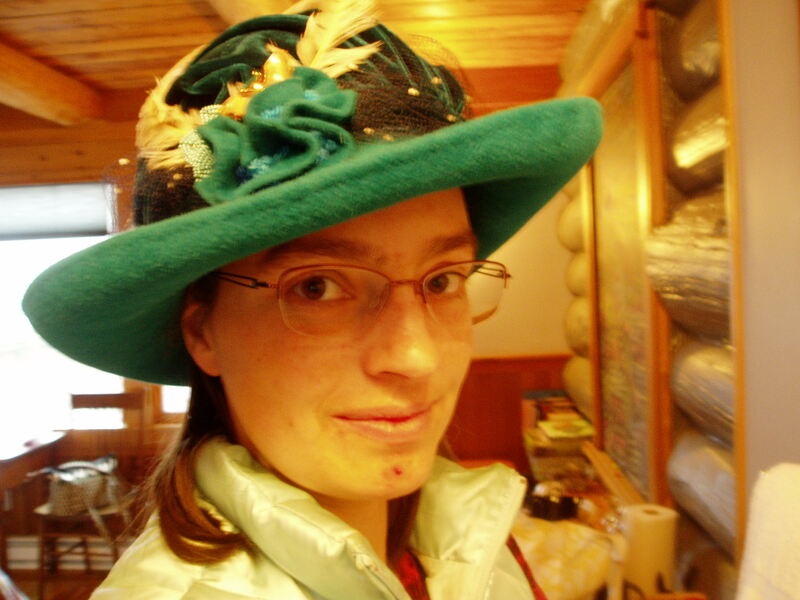 It was a hybrid of at least two of my of creative interests (costume and felting), brought together in a medium that has been a mode of personal expression across the ages: the felt hat. 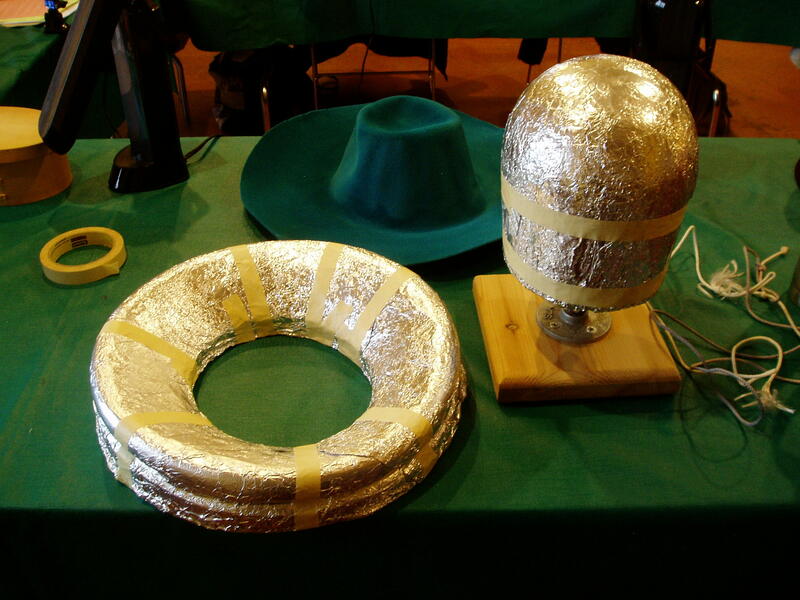 Yes, I had made plenty of hats before–shaping buckram, snitching plastic from ice cream buckets, pleating and stitching. But I had yet to try blocking felt hats. I had visited Swan and Stone’s studio in Vermont and was much intrigued, but a brief observation is never the same as getting one’s hands fully immersed into the process. I had my “materials list” fully populated (stashed in a cheerful fabric tote with an ample supply of pockets), my mandatory hair dryer, and much eagerness as I stepped into the classroom at “Blue North” on a campus that looked like it could have just as easily been perched on the coast of Maine as on the shores of Lake Superior. Friendly Millennial staff and interns were busy checking in students and stoking the wood-fired pizza oven for that night’s potluck festivities. 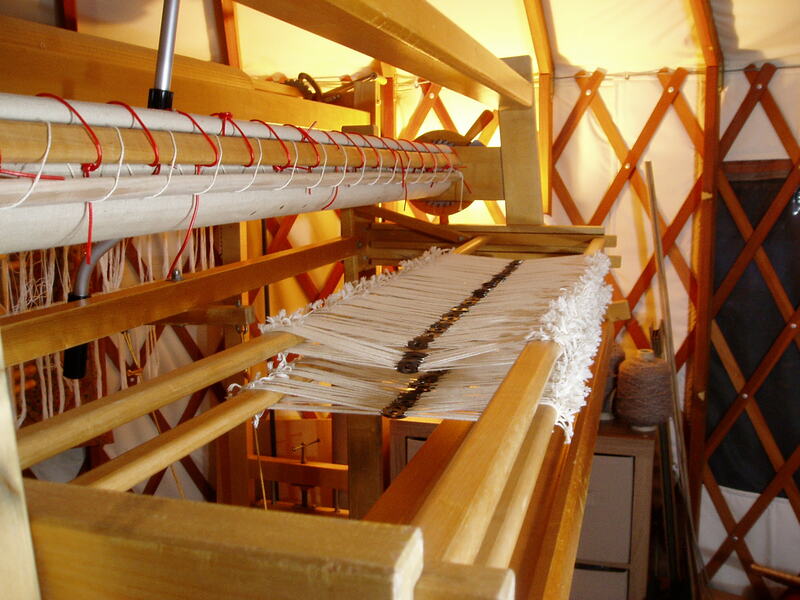 Every room of every building had a class in session–from rosemaling in the room next to ours to Damascus knives in the blacksmith shop to the north, antler baskets across the street to beaded leather mittens in an upstairs room, liverwurst in the kitchen and twig furniture nearby, plus yurt building and wood carving. Everywhere you went, someone was eagerly working away at a project and happy to share their progress story with you. In our classroom, instructor Emily Moe of Moe Sew Co Millinery laid out two tables full of carved wood “blocks,” each one unique and full of character. Some were newly made and stackable, some weathered and stained. Each block, just like each hat, had its own sense of self and style. Previous to coming to class, we had each picked out the color of the wool “blank” for our hats and whether we were making a cloche or a brimmed hat. 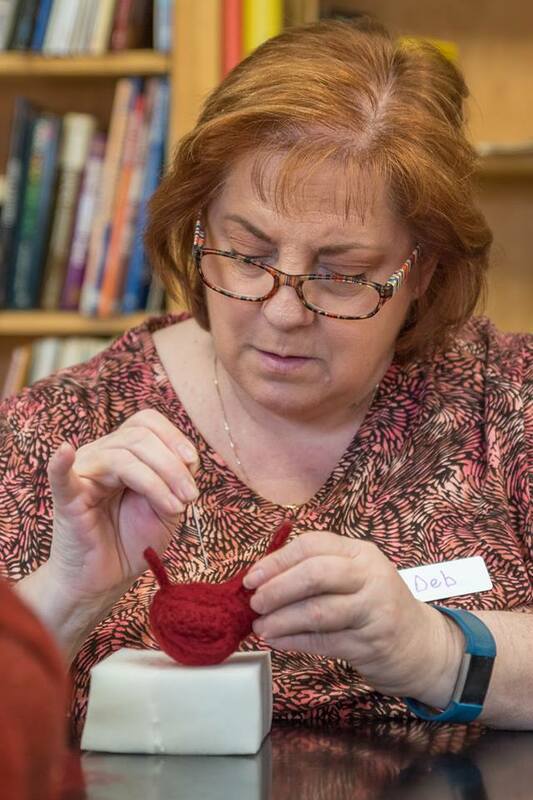 But because no two blocks were the same, no two hats in the class could be the same–which actually made the process much more delightful, since we could learn from each other’s projects as well as our own. I had spent time searching for the right inspiration hat to try to emulate and soon found myself perusing images of the famed hats of PBS’s Downton Abbey. 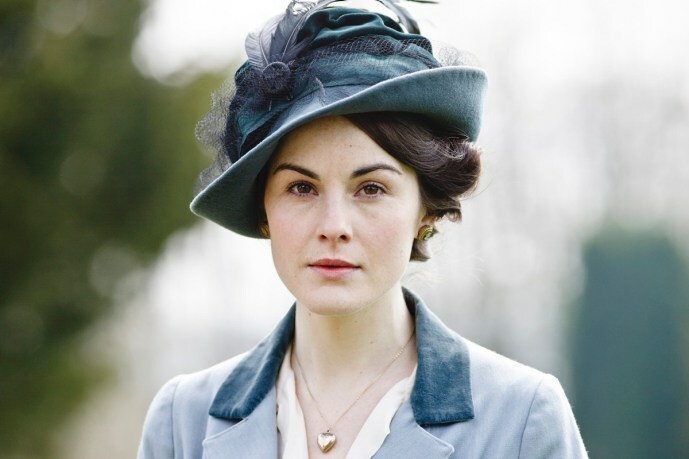 The jaunty angle, creative brim work, and multi-textural adornments on the crown of one of Lady Mary’s blue hats caught my eye. I didn’t have a way to know if this hat was approachable as a beginning milliner, but it seemed like a beautiful piece to strive towards. Emily, however, was encouraging of the pursuit. It didn’t take long, though, to see that I was making the hardest hat in the class (surprise, surprise), replete with having to form the crown separate from the brim. In deference to Emily’s request not to broadcast a play-by-play of the class’ process, I’ll stick to some highlights. If this leaves you curious, take a class! It was a wonderful way to enjoy an immersive weekend off-farm. It grew especially immersive when I put an extra hour and a half into my hat at the end of the first day, so I could be ready for the morning’s next step in the process! Part of my own unique challenge in the hat class was not only learning the felted blocking process (which works up amazingly quickly) but also building the particular adornments that made my hat distinctive. 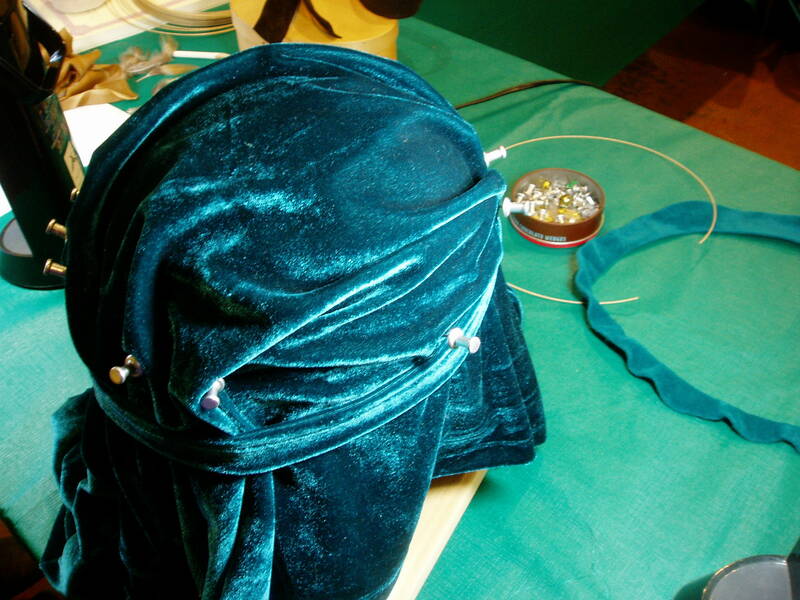 This included reverse-engineering the textured velvet over-cap. In my classic repurposing methods, I had brought an XXL velvet shirt (thrift store find with original retail tags in tact). Using the same wood block on which I had formed the crown of my hat, I draped one side of the shirt over and began tacking it into place to play with creating the right elements of drape and fold. Cutting part of the hem from the other side of the shirt, I used this to create the band at the base of the over-cap. After hand-stitching the drape into the band, I could then trim off the remainder of the shirt. I did. 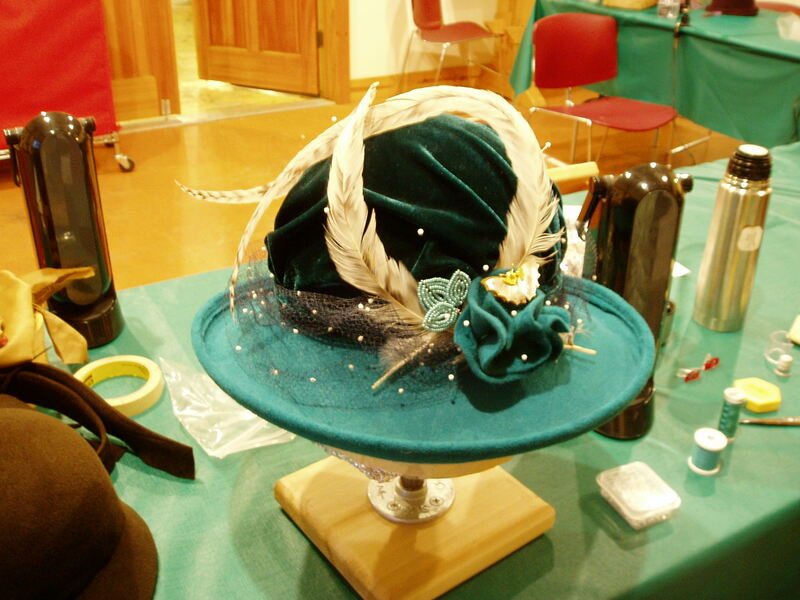 But they all had to come back off the hat for the moment, so I could stitch in the ribbon on the inside of the crown. Then, layer-by-layer, stitching and tacking, the hat came together as a whole. First the velvet over-cap, then the veiling, then those lovely feathers, then the beaded leaves, then the rose (to which I had added some needle felting of yarn into the crevices), and finally the pin. Even with using a thimble, my fingers were incredibly sore by the end of the day! Stitching on that rose (which involved pushing and pulling the needle through five layers of the hat felt) could really have used a pliers! 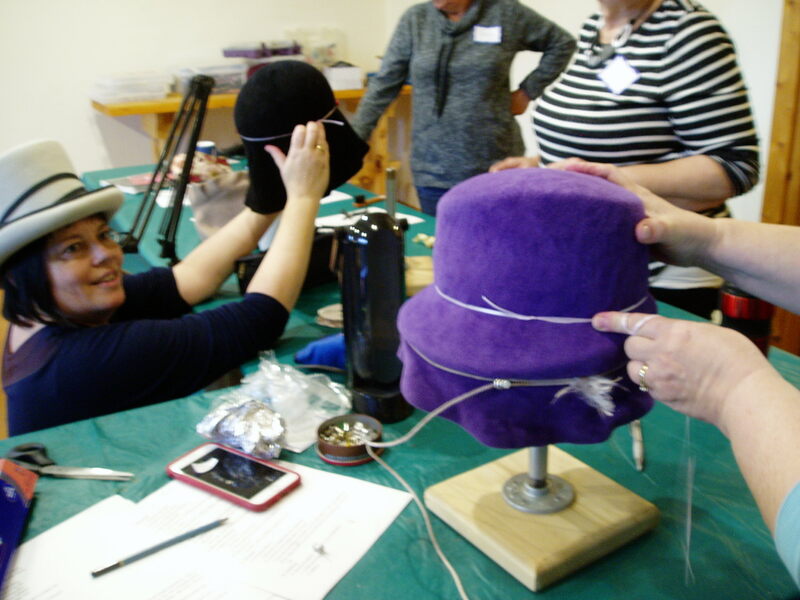 With the decorating part of the hat making process, though, I was completely in my element–posing, stitching, troubleshooting. I could seriously get into decorating hats! Now if only I could find a way to make the blanks using wool from our sheep, wouldn’t that be amazing? But that piece of the puzzle had to wait, as our learning felts were made from the under-fur of rabbits (apparently a friendlier beginner material). 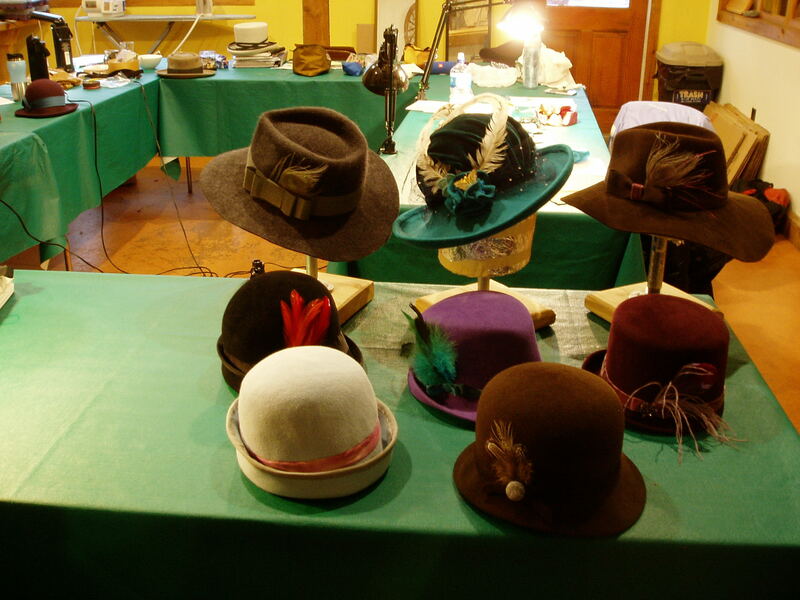 By the end of the two-day intensive, everyone had created a unique and beautiful hat! We brought them together on one of the work tables for a “family portrait.” As my sister commented when I was sharing photos from the adventure, “Everyone made hats, but you made A HAT!” I think that Emily may have secretly wanted to keep it, but she did let me have it back after trying it on and posing for the mirror. I was so proud, eager to get a photo in the mirror back at my vacation rental right on the shores of the big lake. Where will the hat-making adventures lead next? Check later as the journey continues. This month, I entered a piece fresh off the loom for Small Tapestry International 6–a biennial event hosted by the American Tapestry Alliance. The theme was “Beyond the Edge,” and the size limit was under 100 square inches. In tapestry, that is TINY! What could I design and make that would fit the theme, the size restraint, and be a creative challenge? I was interested in trying out a concept–one I had learned originally as a Navajo tapestry technique. Known as “tufting,” when the textile is being woven, pieces of wool lock are laid around a warp thread such that both ends of the strand drape onto the front of the textile. Then the next rows are woven on top, locking the fluffy wool into place. Originally, tufting was worked across the whole of the textile, creating something rather like a full-fleece sheep hide. This would serve as a very warm sleeping blanket or mat for its owner. 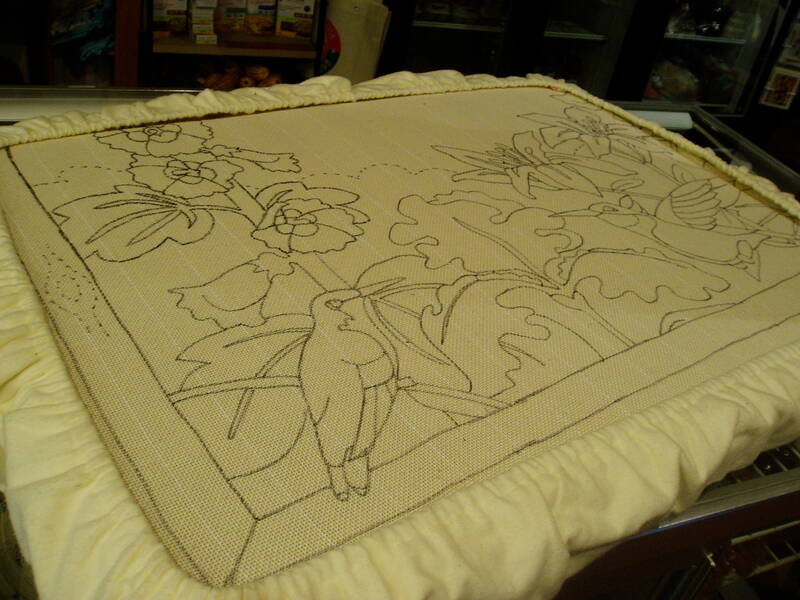 More recently, tufting using locks has been utilized in pictorial tapestry weaving. 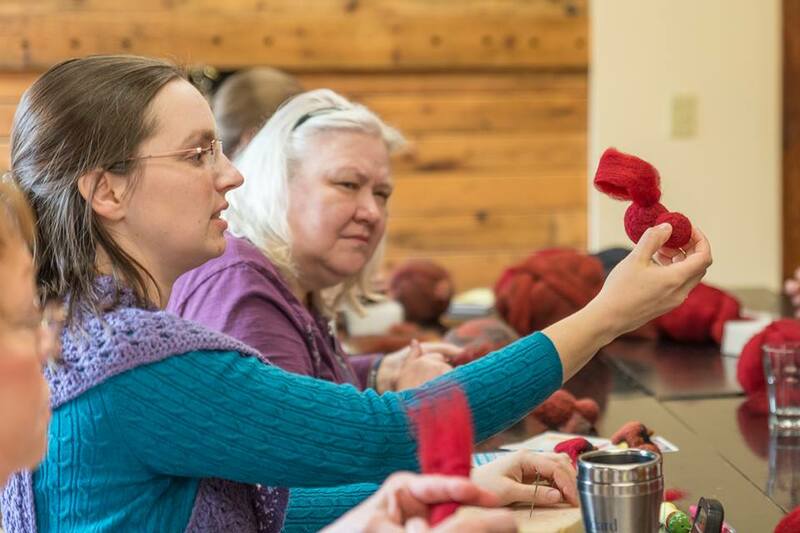 I saw images of tapestries depicting llamas or alpacas with locks on their bodies, adding texture and three-dimensionality while still in Fran Potter’s weaving classes in Madison. I even tried the technique out myself, using our springy wool from our then Hampshire sheep flock–trimming the locks with a scissors to mimic the shape of the sheep it depicted in relief. It was fun to work the technique and freed tapestry from being a fairy flat medium into involving more depth and touchable character. And yet, though it was fun, I put away that technique for years after the one experiment. But now I was curious. Was there a way to engage the concept of tufting but use it with other materials? Could, for instance, feathers be laid in and duly sandwiched between packed weft, like the locks? How might this change the expression abilities of the medium? The feathers I had at easy disposal for the experiment were saved up from my own flock of chickens. So I went looking for a cartoon idea in photos of my own bird friends. 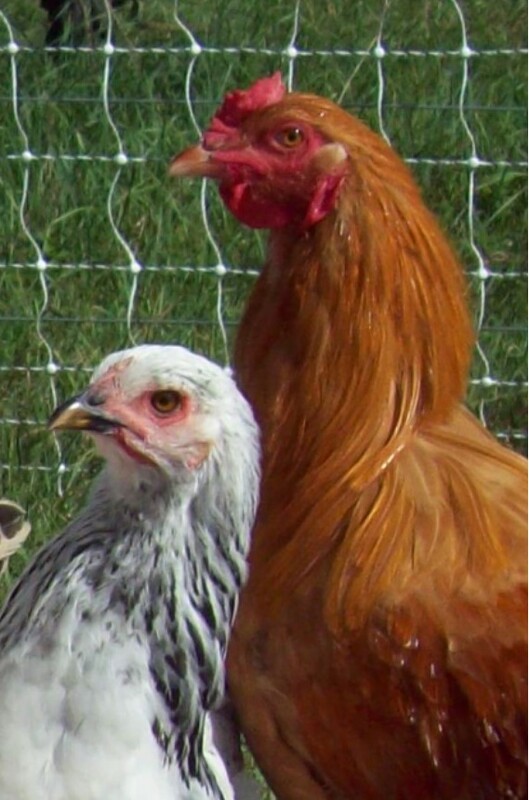 I settled on cropping a view from a sunny morning, snapped during chores of these two cheery chickens. There was great color contrast, highlights, a sense of motion, and visual interest–a great starting point. But staying in the mini scale meant that some of the elements would not be “weavable” in any believable way. These included the fencing in the background and the eyes of the birds. Editing out the fence was easy enough, but what about the eyes? You can’t have chickens as the “subject” of a tapestry and punt on the eyes! Time to think outside the usual toolkit box once again, and this time I went to Amazon.com. “What did you just order?” Steve asked, as he was checking his email. “Taxidermy eyes?” Well, yes, mini glass taxidermy eyes. “Chicken” was not an option, but 7mm “Red Tailed Hawk” was, so I went with that. And they duly arrived in tiny packaging in the mail the next week. Now, how was I going to add these to a weaving, with only flat, smooth backs to work with? I think it would be great if they made these as buttons! That would have been very helpful. Still, I had so much fun with these, once I figured out how to make them weavable. The tufting challenge came first. Unlike wool locks, feathers have a stiff core, and there was no looping it back to the front of the piece. 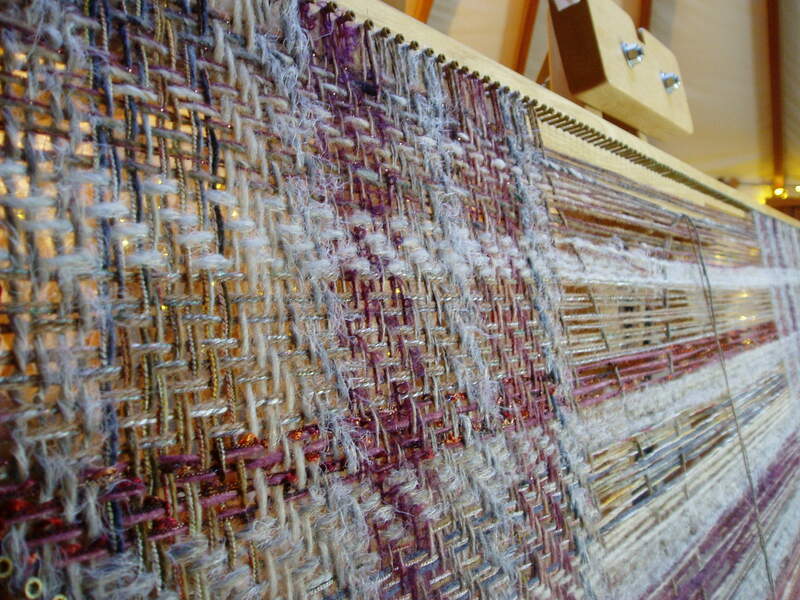 I would have to press that hard part out to the back side of the piece, trimming it off once the tapestry grew in height enough to prevent the feather from accidentally falling or pulling out during the weaving process. 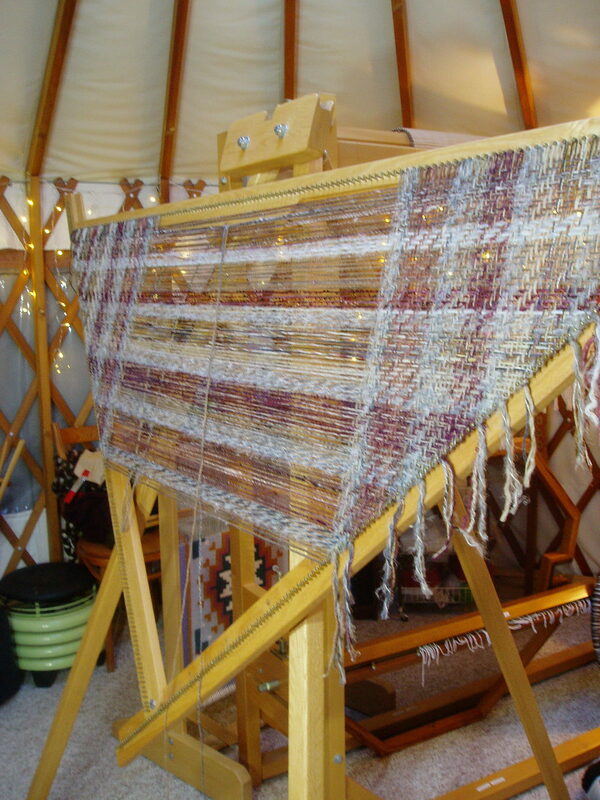 I used one of my small “study” looms, which made the work portable and easy to set up for weaving a project with a fast approaching submission deadline. In fact, I grew so engrossed in the project that I didn’t take any more pictures of the process beyond this one, so it’s hard to see how the feather “tufting” process proceeded. It was a great learning piece for testing out the concept before applying it to larger-scale projects in the future. I’ll have to get better process pictures next time! For attaching the eyes, I glued string onto the back using Mod Podge, pulled them through the tapestry, and then pulled them through a button on the other side, tying them tightly. This secured the eyes onto the piece without gluing them on top, but they still stuck out like stationary bobble eyes. What to do about this situation? There was no woven answer, but there was an embroidery answer. In fact, with a piece at this tiny scale (10 x 6.5 inches), embroidery became the answer for many detail issues. Layer by layer–feathers, glass eyes, embroidery accents–the piece was taking on a textural life of its own that was both challenging and fun, intriguing and experimental. And it was freeing to simply ask, “What happens when I try…” and not feel burdened by the tradition of form or the magnitude of needing to get a large piece “right.” Artists need experimental breaks like this to keep their work fresh and infused with life. And then it was time for mounting the piece. Since I had left off the fencing from the image, I decided to incorporate actual chicken wire fencing between the frame and the piece, almost like it was matting but more like a shadowbox with the raised nature of the wood of the framing, which we constructed in our farm’s shop from scrap lumber found in the shed. The framing part was a full-family team project, with rounds of troubleshooting and specialty tools I’m happy to let more experienced hands operate. 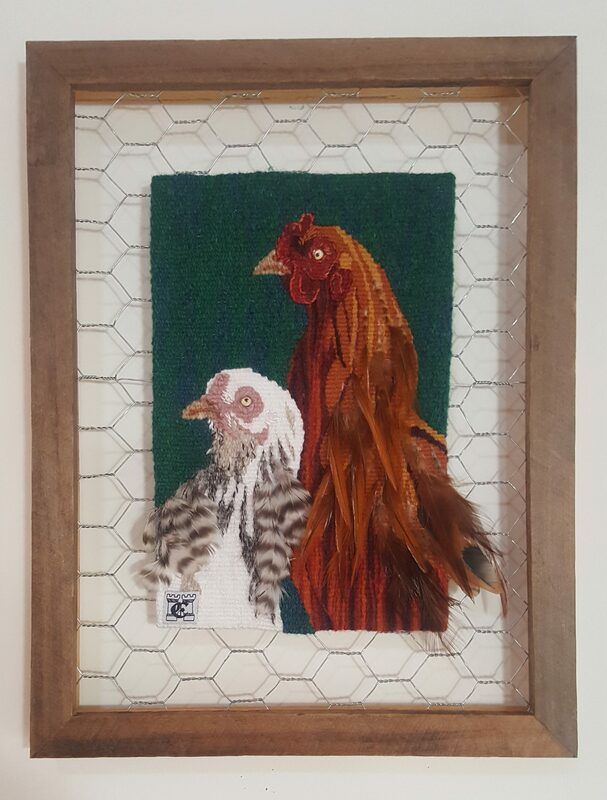 So now you can see the interplay of tapestry weaving, feathered tufting, glass taxidermy eyes, and embroidery technique, framed with a real farm theme. Here is what I wrote about the piece for submission to the tapestry exhibit. “We’re Looking at You” seeks to continue the conversation with that idea, as well the challenge the typical roles of viewer and viewed in tapestry, with glass eyes that follow the human spectator. The cartoon for this piece came from cropping a photo I took of my laying flock on a sunny summer morning. It was time for their breakfast, and all eyes were on the bearer of the bucket! Playful experimentation continues with the adaptation of the Navajo tapestry technique of tufting—utilizing feathers from my own chickens instead of the customary wool locks. Embroidery textural accents finish off the subtle three-dimensionality of the imagery at this tiny scale. Submission is complete, so now I have to wait to see if it is selected in the juried process for the two gallery exhibits this coming summer. Stay tuned for the announcement! 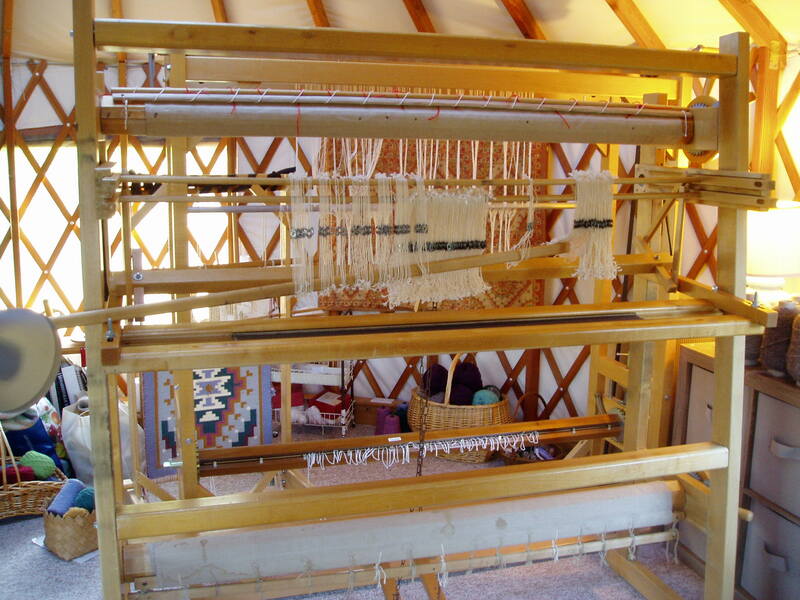 The adventure continues in the restoration of the Finnish tapestry loom, gifted to me by weaver Christine Hensolt. There were so many bits and pieces, and trying to determine what went where was quite the engineering adventure. Fortunately, the beams had been labeled in pencil to note which went where and right and left. But some pieces were a mystery or were simply missing. My Grandpa is currently working in his wood shop to turn new handle pegs for the two rachet tensioners (like the one shown at left). My dad Steve helped with cutting threaded rod and even bolt spacers for rebuilding the structure. And Mom helped me make sense of the jointed elements that actuate the heddles, as well as troubleshoot what to do about the missing threaded rod in the upper right structural beam. So, in all, it was a team effort to bring this loom back to life. Here are a few more images as the process unfolded. Here, the frame is roughly set together, with the warp beam at the top. 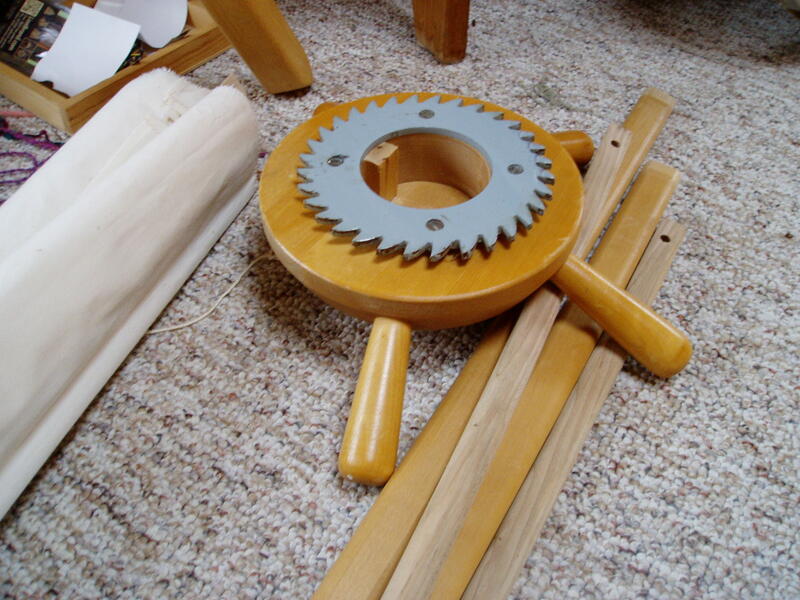 You can see the holders that will carry the jointed heddle system. 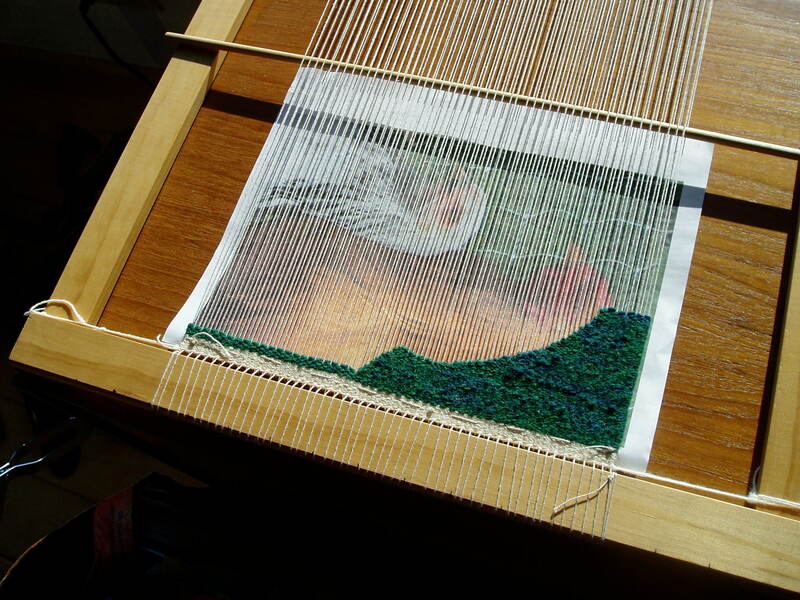 Now the heddles are being threaded onto their rods. 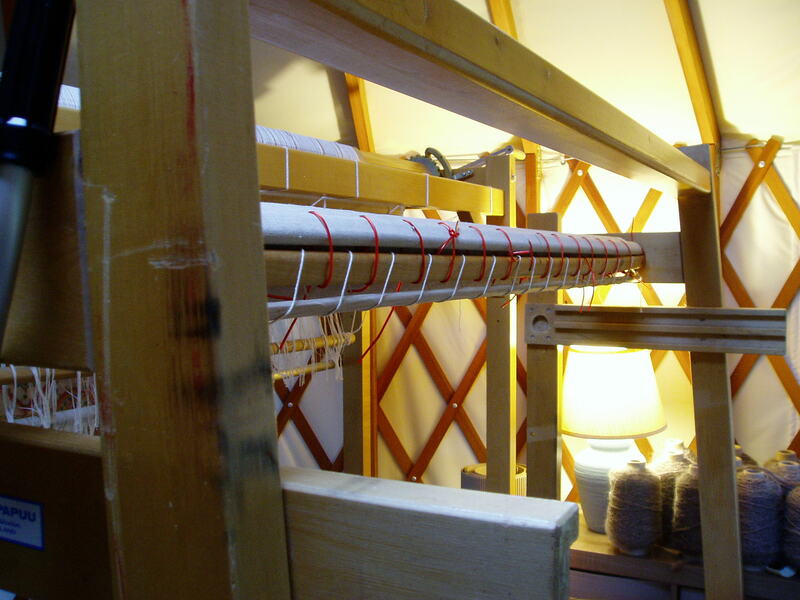 The reed and beater bar are in place, as is the cloth beam below. Finally, the heddles are finished and tied to the foot pedals. It’s a little stiff, so I’ll grease the skids with some beeswax and see if that helps. It should be nearly ready to weave again!